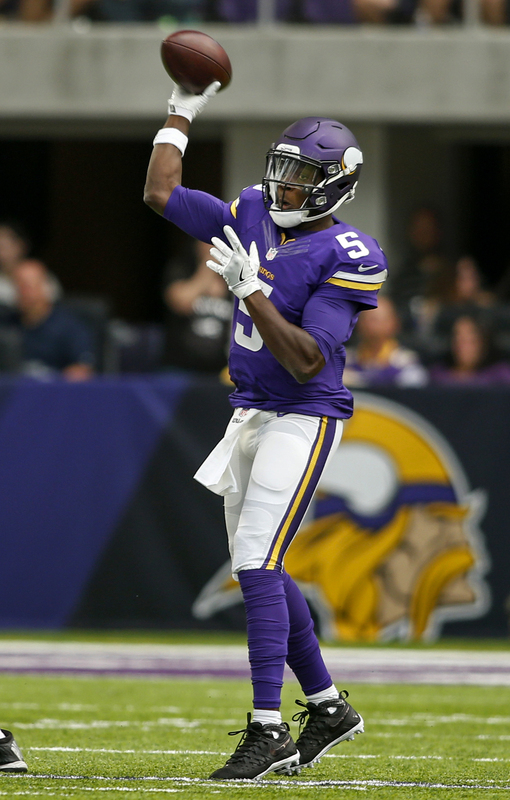 Teddy Bridgewater will be activated to the Vikings’ 53-man roster, Chris Mortensen of ESPN.com tweets. Meanwhile, the team is discussing whether Sam Bradford will be placed on injured reserve. Moving Bradford to IR could be the Vikings best option given the way that Case Keenum has played in his absence. The Vikings also know that they will probably lose preseason standout Kyle Sloter if they try to sneak him through waivers and on to the practice squad. Keenum is expected to remain the starter for the time being with Bridgewater as a backup. If Keenum falters against the Redskins on Sunday, the Vikings could have another QB dilemma on their hands. In 2016, Bradford set the NFL record for completion percentage in a season at 71.6%. This year, however, he has been dealing with serious knee troubles and has appeared in only two games. Bradford opened up the season by completing 27 of 32 passes against the Saints for three touchdowns and no interceptions, but he did not return to action until Week 5 against the Bears. After getting re-injured midway through that game, we have not seen Bradford take the field since. The Vikings outbid multiple suitors to sign Kyle Sloter to their practice squad, and the move ended up seeing the former college wide receiver promoted to the active roster in advance of Week 2. 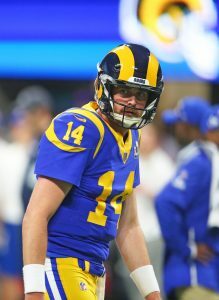 In addition to the Broncos, the Vikings presented a better offer than the Redskins or Bills in order to land Sloter, Courtney Cronin of ESPN.com reports. 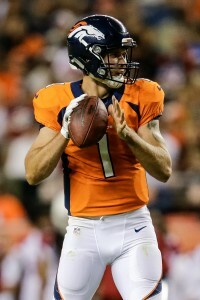 A wide receiver at Southern Miss before a transfer to Division I-FCS Northern Colorado put him loosely on the quarterback radar come UDFA signing time, Sloter played extensively for the Broncos during the preseason. John Elway hoped the Broncos could pass him through waivers to Denver’s practice squad, but the GM preferred more experience to start the season. This led to the Broncos’ decision to reunite with Brock Osweiler for the time being. Sloter’s active-roster contract won’t pay him much more than his practice squad agreement, since the latter deal is on the higher end of such accords, and the pact is nonguaranteed, Chris Tomasson of the St. Paul Pioneer Press reports. He did not receive a signing bonus. Despite the insurance addition, Sam Bradford is still expected to start against the Steelers. Case Keenum resides as his backup. Here’s more from the NFC North. The Bears will be without Pro Bowl guard Kyle Long for a second straight game to start the season. The team announced Long did not travel to Tampa Bay for the Bears’ Week 2 game. Rich Campbell of the Chicago Tribune notes (on Twitter) the Bears are hoping Long returns in Week 3. Long has not played since November of last season. A right ankle injury ended Long’s season, and the subsequent recovery process has now reached the 10-month mark. Prior to Long’s ankle injury, he’d missed one game out of a possible 56. Tom Compton started at left guard last week against the Falcons. Michael Floyd‘s activation after a four-game suspension could make for an interesting roster decision, with Tomasson noting (Twitter link) the Vikings would prefer to keep wideout Rodney Adams on the roster. A rookie fifth-round pick out of South Florida would seemingly be vying with a player of a similar profile to stay on the roster after Floyd returns. Seventh-round rookie Stacy Coley, out of Miami, serves as Minnesota’s other other newcomer wideout. Coley, though, played in Minnesota’s Week 1 game while Adams was a healthy scratch. Jarius Wright and 2016 first-rounder Laquon Treadwell are the second-stringers. The Vikings’ preference for Jayron Kearse and Anthony Harris led to Antone Exum being the odd man out when it came time to clear a spot for Sloter, Tomasson tweets. Second-round Lions pick Teez Tabor is making progress, but the former Florida cornerback might not be in line to see much action for a while. A 15-game starter for the Packers last season, Ladarius Gunter is now employed by another team. The Panthers claimed the third-year UDFA on waivers. Saints running back Adrian Peterson downplayed his frustration with playing time following his team’s season-opening loss to the Vikings. Despite video clips showing the veteran yelling at head coach Sean Payton, Peterson was clear that the entire situation was blown out of proportion. Peterson finished the contest having played only nine snaps, and his 18 rushing yards was his lowest total since the 2015 season. While he acknowledged some frustrations with his lack of use, he believes the situation will inevitably sort itself out. Patriots offensive coordinator Josh McDaniels and defensive coordinator Matt Patricia lead Sports Illustrated’s Robert Klemko’s list of the top-10 head coaching candidates. Lions defensive coordinator Teryl Austin is third on the list, while Eagles defensive coordinator Jim Schwartz and Giants defensive coordinator Steve Spagnuolo round out the top-five. When asked if Jets ownership would still trust general manager Mike Maccagnan to draft a quarterback, ESPN.com’s Rich Cimini acknowledges that it’d be “unconventional” to let the executive go after only three seasons. However, the writer also notes that Maccagnan still needs to be evaluated for his ability to draft signal-callers, especially after the selection of Christian Hackenberg. Ultimately, Cimini is willing to give the general manager until the end of the season, as there’s still time for Hackenberg (and teammate Bryce Petty) to show improvements. However, if the quarterbacks aren’t developing, then there’s some obvious cause for concern. The Vikings promoted Kyle Sloter to their active roster earlier today, but Chris Tomasson of the St. Paul Pioneer Press observes (via Twitter) that the quarterback won’t be earning a huge pay raise. Sloter was already making more than your standard practice squad player, so his salary will “only” be boosted from $20K per week to a bit more than $27K per week. Despite reports that the Vikings are “cautiously optimistic” about Sam Bradford‘s ailing knee, the team has still made a move to add depth at the position. According to Miles Garrett of FOX5News in Atlanta on Twitter (and later confirmed by the team), the Vikings have signed quarterback Kyle Sloter to the active roster. To make room, the team has waived safety Antone Exum. Sloter, an undrafted rookie out of Northern Colorado, signed with the Broncos following the draft, but he was waived by the organization earlier this month. He subsequently signed with the Vikings practice squad with the understanding that he was effectively going to be the organization’s third quarterback. The 23-year-old’s collegiate career was limited, as he served as a reserve for Southern Miss and Northern Colorado between 2013 and 2015. However, he had a breakout campaign in 2016, completing 62.1-percent of his passes for 2,656 yards, 29 touchdowns, and 10 interceptions. If Bradford was forced to miss anytime, Sloter would presumably be the backup behind Case Keenum. We learned yesterday that Bradford was dealing with “swelling, pain and discomfort” in the same left knee that had been repaired for torn ACLs in 2013 and 2014. While the team has their concerns, there’s still optimism that he’ll play this Sunday against the Steelers. Bradford had a standout performance in Week 1, completing 27 of his 32 attempts for 346 yards and three touchdowns. Exum Jr. had spent the first three-plus seasons of his career in Minnesota after being selected in the sixth round of the 2014 draft. The 26-year-old has served mostly as a reserve and special teamer, compiling 19 tackles and one forced fumble in 27 career games (two starts). He was waived/injured in 2016 after suffering a leg injury, and he ultimately landed on the team’s injured reserve. The Vikings are stuck with nearly $29K in dead money following his release. New Cowboys cornerback Bene Benwikere needs to be on the team’s 46-man gameday roster four times in order for the Bengals to receive Dallas’ sixth-round pick in 2019, ESPN.com’s Todd Archer tweets. The corner was shipped to his fifth team in eleven months in the Sunday trade. The Vikings gave quarterback Kyle Sloter an above-average salary of $20K/week to join the practice squad, allowing them to outbid the Broncos, Redskins, Eagles, Falcons, and others, Chris Tomasson of the Pioneer Press tweets. Sloter excelled in the preseason, but the Broncos went in a different direction to solidify their quarterback void. The Jets auditioned tight end Tim Wright, as Howard Balzer of BalzerFootball.com tweets. Wright, who is now years removed from playing his best football, was recently cut loose by Detroit. The Broncos have waived quarterback Kyle Sloter, according to Mike Klis of 9News (Twitter links). Sloter’s release — and Paxton Lynch‘s lingering injury — means Denver will likely bring in a veteran quarterback, per Klis, who speculates the club could target Brock Osweiler. Two player sources expect the Broncos to target Osweiler in the near future, tweets Klis. Osweiler, of course, spent four seasons with the Broncos before signing with Houston last spring. He’s a free agent after being released by the Browns this week, and would only cost the minimum given that he’s earning $16MM from Cleveland. Sloter, for his part, is a rookie undrafted free agent out of Northern Colorado. He could conceivably slip through waivers and be placed on Denver’s practice squad.